These streams can be easily accessed from the triad. The North Toe in Spruce Pine, NC is Mountain Heritege Water and Delayed harvest regulations. It's bigger water than Stone Mountain or the Mitchell River. It's stocked heavily and holds quite a few bigger fish (over 18"). This sections flows through downtown Spruce Pine. There is a Park with parking, a playground, a small pavilion, a handicapped pier, walking path and rest rooms at the upper end of the DH section which would be great for family outtings. The lower section is still easily accessible but without the amentities. Since it's right in town cell service is readily available. It fishes well with some deep holes and nice runs and riffle. Take I-40 west to exit 86 then go north on Rt 226 through Marion to Spruce Pine. At the bottom of the hill where 226 intersects Rt 19 go straight through the intersection (226 goes to the left) which becomes Highland Ave. It's a short distance to the river. There is a stop light just before the river. Turn right and bear left on the first side street to go to the Park and upper section. Turn left at the light and bear right after you pass Ingles on the first small street to get to the lower section. ​Great mountain stream protected by mostly national forest. 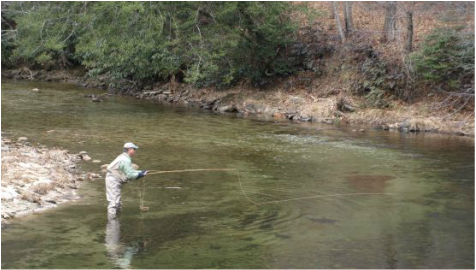 This rivers offers Wild Water, Game Land, Delayed Harvest and Hatchery Supported. From W-S area take I-40 West to Morganton. Take Hwy 18/181 exit to downtown Morganton. Continue to follow 18/181 north out of downtown Morganton. Follow 181 for several miles and turn right onto Brown Mtn Beach Road (SR1337). Follow for several miles and turn left again onto Brown Mtn Beach Road. Wilson Creek with be on the left hand side beginning with the Hatchery Supported section.